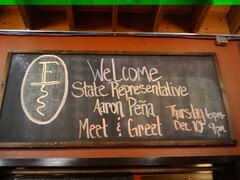 Tonight, Feldman's Market Center hosted a holiday reception for Texas State Representative Aaron Peña. They provided food, drink, and a place for supporters to come meet and greet the Representative. They did an excellent job tonight; we were impressed with their hospitality. The event attracted quite a crowd considering the Representative is so far running unopposed. We like to think it's because the Rep. is a great guy; but it may also have to do with Feldman's being a great place. We had a great turnout at the reception. We are thankful for all who came to enjoy a good time amongst good people.